Speed management is a significant challenge for most communities in the United States. This is particularly true for small, rural communities where the main roadway through the town serves a dual role. Outside the town, the roadway provides high-speed travel over long distances; within the built-up area, however, the same roadway accommodates local access, pedestrians of all ages, on-street parking, bicycles, and the many other features unique to the character of a community. This convergence of roadway purposes presents both an enforcement challenge for the community and a potential safety problem for the public. Addressing the issue through law enforcement alone often leads to temporary compliance at a significant cost. A more permanent way to reinforce the need to reduce speed is to change the look and feel of the road by installing traffic calming treatments that communicate to drivers that the function of the roadway is changing. 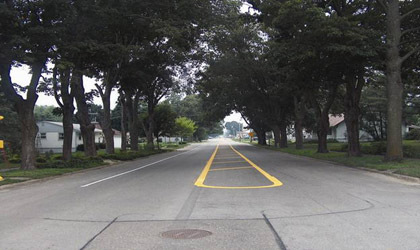 Traffic calming has been evaluated and used extensively within low-speed urban areas in the United States but less so in rural areas where driver expectations and traffic characteristics are different. Through, paved, major county or state highway. No traffic calming currently in place or planned. No construction, reconstruction, or significant maintenance activities planned along the route during the study period. No adverse geometry such as sharp horizontal curves or steep vertical curves where treatments would be placed. Initial speed studies were conducted in the 18 communities, and 5 were selected as pilot-study locations. These five locations were found to have the most significant speeding problems, as determined by the difference between the posted speed and prevailing travel speed. Ability to accommodate farm vehicles and large trucks. Compatibility with the rural setting and driver expectations. Treatments were selected for each study location in cooperation with local agencies. Seven different low-cost, traffic-calming treatments were implemented and evaluated in the five communities as shown in table 1. In some communities, a single traffic calming measure was installed, and in others, a combination of measures was implemented and evaluated. Speed limits ranged from 55 mi/h to 60 mi/h outside the community and from 25 mi/h to 35 mi/h inside the community where the treatments were applied. Unless otherwise noted, treatments were placed from July through August 2006. Any treatment that included pavement markings was repainted in May 2007, just before the 12-month "after" data-collection period. Table 1. Summary of treatments by Iowa community. 1A request for experimentation was submitted to and approved by FHWA for this treatment. Speed and volume data were collected by a roadside traffic recorder using pneumatic road tubes placed across the road. Data were collected immediately downstream of each treatment or in the case of road narrowing near the midpoint of the section. For Roland and Union where combinations of treatments were applied, data were also collected 0.5 mi upstream of the first treatment in order to determine whether speed changes observed were due to the treatments or to normal variation in speeds. Results in this TechBrief are presented only for vehicles in the direction of travel that actually passed through the treatment. An in-depth discussion on data collected at other locations is presented in the full report. After final locations were selected, a formal "before" speed study was conducted to establish baseline speeds and volumes. Speeds of all vehicles were collected continuously for at least 48 hours during each deployment. 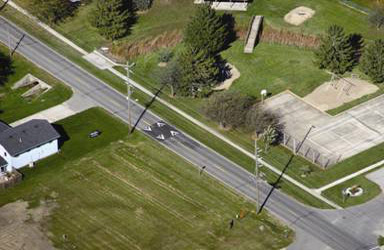 Data collection was planned at 1-, 3-, 6-, 9- and 12-month intervals after installation of the traffic-calming treatments. In several cases, data were not collected for a particular "after" period, mainly due to adverse winter conditions. Most of the communities do not have any police officers and have no regular traffic enforcement, instead relying mostly on county sheriffs who drive through the community occasionally. Each community was asked to not change or request additional enforcement during the study period and to report any unusual speed enforcement or any other unusual activities. When additional enforcement or any unusual situation coincided with data collection, the data were discarded and recollected the following week. For instance, one community decorated the area around the roadway for Flag Day, and in one community roadway maintenance occurred during a data-collection period. In both cases, data were discarded and recollected. Data were only collected during nonholiday weekdays. Vehicular speed was the primary measure used to evaluate the effectiveness of each treatment. This report presents changes observed in the 85th percentile speed of all vehicles. The 85th percentile speed is the speed at or below which 85 percent of the vehicles are traveling. Each data set had at least 630 vehicle speed samples. In almost all cases, differences were statistically significant at the 95-percent confidence level. The effects on mean speed and the percent of vehicles exceeding the speed limit by various amounts, along with statistical significance, are presented in the full report but not within this TechBrief. In most cases, only minor reductions in mean speed resulted. The changes in the percentage of vehicles exceeding the speed limit by various amount correlated with the changes in 85th percentile speeds. Overall, the treatments appeared to have a greater effect on drivers traveling at higher speeds. The effectiveness of each traffic-calming treatment is discussed in the following sections. A brief description and photograph of each treatment is provided, along with a summary of the effects on speed. The transverse markings consisted of a series of parallel bars on the inside edges of the travel lane. The spacing between bars decreased approaching the community. The series of markings are intended to create the perception that the vehicle"s speed is increasing to trigger driver awareness of the need to slow down. The transverse markings were 12 inches wide (parallel to roadway edge) by 18 inches long (figure 1). The markings were installed at the north, south, and west entrances to the city of Union. Markings were placed in advance of and terminated at the speed limit sign which established the speed within the community. The length of each series and distance between bars varied based upon each speed transition and location within the series. Figure 1. Experimental transverse markings at entrance to Union. 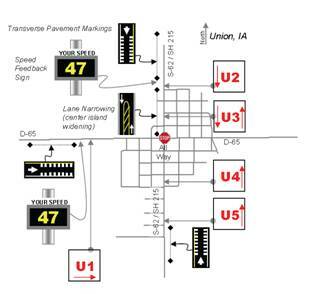 Speed feedback signs (figure 2) were also installed within Union. These signs consisted of a static "Your Speed" sign and an electronic display of the approaching vehicle speed measured by radar. These signs were installed for inbound motorists at the north and west city entrances and were placed immediately downstream of the transverse markings as shown in figure 3. Due to purchasing and installation problems, the signs did not become operational until just before the 9-month data collection period. Figure 2. Speed feedback sign in Union. Figure 3. Treatment and data collection locations in Union. Table 2 shows the change in 85th percentile speed by location and observation period. For the south entrance (U5) where transverse markings were the only treatment installed, there was little change in prevailing speed. Similar results were found for southbound traffic entering the north side of town (U2) and eastbound traffic entering from the west (U1) prior to the installation of speed feedback signs. Table 2. Speeds before and after transverse pavement markings with and without speed feedback sign (SFS) at the entrances to Union. After the feedback signs were installed, speeds dropped an additional 3 mi/h to 6 mi/h at the north and west entrances during the 9- and 12-month analysis periods. Since the signs were only in place for a short period of time, it is not known if the observed speed reductions persisted over the longer term. Median and shoulder pavement markings shown in figure 4 were used to reduce lane widths for a section of S-62/SH 215 within Union. The existing two-lane roadway was 40 ft wide from curb to curb with parallel parking allowed on one side. A 10-ft-wide painted center island was used to reduce the existing lane widths from roughly 16 to 11 ft in each direction. A solid 6-inch channelizing line was painted to separate the travel lane from an 8 ft parking lane. Drivers were expected to slow down due to feeling constrained by narrower lanes. Table 3 summarizes speed data collected midway through the narrowed section (U3), as shown in figure 3. Results are presented for both directions of traffic, as both were exposed to the lane narrowing. No other traffic-calming measures were in place at this location. Table 3. Speeds before and after narrowing lane using painted center island and edge line markings. No consistent changes in 85th percentile speed were observed for either direction. In some cases, vehicle speeds decreased; in other cases, vehicle speeds increased. The variability in speeds suggests that the treatment was not effective and that other factors may have influenced speeds. Speed data collected at a point upstream of the north section where vehicles were not influenced by any of the traffic-calming treatments exhibited an overall upward speed trend. This suggests the observed increases in speed were due in part to general time trends. Even though the roadway was reduced from 16 ft to 11 ft lanes in each direction, the lanes may have still been too wide to affect driver behavior. A more drastic reduction in lane width (e.g., 9 ft lanes) or a physical barrier (e.g., raised curb) may be necessary to produce the desired effect since there are no consequences for driving over the pavement markings. Figure 4. Painted center island and edgeline used to narrow lane. A series of converging chevron markings shown in figure 5 were installed on County Road E-18 on both entrances to Roland. The markings began 221 ft in advance of and terminated at the speed limit sign which established the speed within the community. The distance between chevrons gradually decreased from 25 ft to 18 ft, and the width of the markings decreased from 36 inches to 6 inches in the direction of travel, giving the perception of increasing speed. The pavement marking legend "25 MPH" was installed at the end of each chevron series to reinforce the posted speed. Figure 5. Experimental converging chevron markings followed by "25 MPH" pavement legend. As shown in table 4, the 85th percentile speed decreased up to 4 mi/h, while 1 mi/h was more typical for the various analysis periods. Although the chevron markings were somewhat effective in reducing vehicle speeds, prevailing speeds were still 7 mi/h to 9 mi/h above the posted speed limit 12 months after implementation. Table 4. 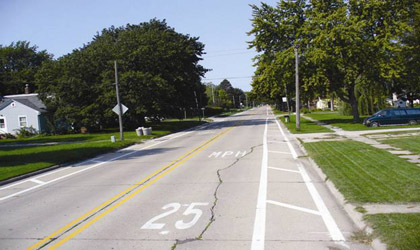 Speeds before and after installing converging chevron markings and "25 MPH" pavement legend. A wide edgeline and cross-hatch markings, as illustrated in figure 6, were used to create a shoulder on both sides of the roadway and reduce lane widths for a section of E-18 within Roland. The existing two-lane roadway was 36 ft wide from curb to curb. The painted shoulders reduced the lane width to 10.5 ft in both directions. The narrow lane was intended to make drivers travel slower due to feeling constrained. White pavement marking legends indicating "25 MPH" were placed at regularly spaced intervals within the narrowed section to remind drivers of the speed limit. Figure 6. 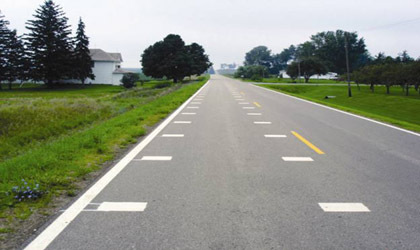 Shoulder markings used to narrow travel lanes in Roland. Data were collected at the midpoint of the narrowed section. As shown in table 5, the lane narrowing and speed limit markings were not effective in reducing vehicle speeds. There were no consistent changes in the 85th percentile speed by analysis period or direction of travel with both increases and decreases recorded. In most analysis periods, there was no change in traffic speed compared to speeds measured before the lane narrowing. No data were collected 6 months after the change due to adverse winter weather. Table 5. Speeds before and after lane narrowing using shoulder markings combined with "25 MPH" pavement legend. Even though the eastern section of E-18 was reduced from a 36 ft cross-section to 10 ft lanes, the lanes may have still been too wide to affect driver behavior. A more drastic reduction in lane width (e.g., 9 ft lanes) or a physical barrier (e.g., raised curb) may be necessary to produce the desired effect since there are no consequences for driving on pavement markings. A speed table (figures 7 and 8) was installed on County Road E-23 within the center of Gilbert. 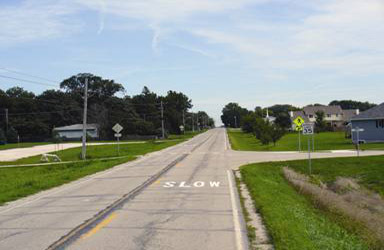 The two-lane asphalt roadway has grass shoulders, no curb, and a 25 mi/h posted speed limit. The speed table was 3 inches high and 22 ft in the direction of travel, including 6 ft ramps at both ends. 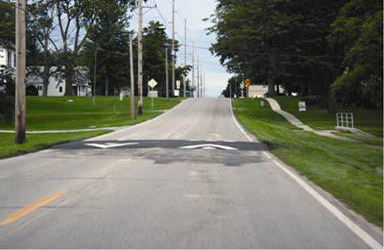 The asphalt speed table was designed to be traversed at 30 mi/h to accommodate heavy trucks and farm vehicles. Figure 7. Aerial view of speed table in Gilbert. Figure 8. Driver view of speed table in Gilbert. The speed table was very effective in reducing speeds. As shown in table 6, 85th percentile speeds were reduced at the hump location by 4 mi/h to 5 mi/h over all "after" periods to within a few miles per hour of the 25 mi/h posted speed limit. Approximately 200 ft downstream of the speed table, speeds were still 4 mi/h lower than baseline speeds and within 5 mi/h of the posted speed. Table 6. Speeds before and after installing speed table. Tubular markers shown in figure 9 were used to create two center islands along the southern section of R-39 in Slater. At this location, the roadway is 26 ft wide from curb to curb. Center islands were formed by placing two rows of 36-inch-tall yellow tubular channelizing markers to reduce lane widths to 11 ft in each direction. The tubular markers were spaced 4 ft apart in the taper and 8 ft elsewhere. A 25 mi/h speed limit sign was placed on a mountable sign support at both ends of each island. The first island was located at the southern entrance to Slater, just after the first posted 25 mi/h speed limit sign. The second island was located approximately one block north of the first island. Figure 9. Tubular channelizing markers used for center island to narrow lanes. Although the treatment was designed to accommodate agricultural equipment and maintenance vehicles such as snowplows, the markers were damaged during winter operations and were removed for 6 weeks. The markers were reinstalled as soon as no more snow events were expected. Table 7 shows the speed data collected midway between the two center islands. 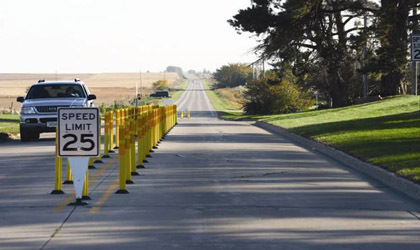 The data indicate the islands using tubular channelizing markers reduced vehicle speeds; 85th percentile speeds decreased by up to 3 mi/h when the tubular markers were in place and increased up to 4 mi/h when the tubular markers were removed. Similar speed changes were also observed for inbound traffic just downstream of the second island. Even with the speed drop, 85th percentile speeds were still 10 mi/h to 15 mi/h above the posted speed limit. Table 7. Speeds before and after lane narrowing using center islands with tubular markers for traffic entering (NB) and leaving (SB) Slater. A speed feedback sign pictured in figure 10 was installed on County Road R-38 for inbound traffic at the north entrance to Slater. This section of R-38 is adjacent to an elementary school, has a 25 mi/h posted speed limit, and has a rural cross-section with steep shoulders and open ditch drainage. Figure 10. Speed feedback sign in Slater. The sign display varied based upon vehicle speeds measured via radar. The sign remained blank (black) when no traffic was present or when the approaching vehicle speed was less than or equal to 25 mi/h (or greater than 75 mi/h). 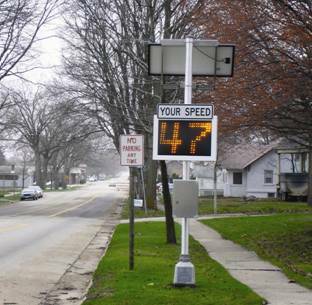 Between 26 mi/h and 29 mi/h, the sign displayed the text "Your Speed" along with the measure vehicle speed, as shown in figure 10. 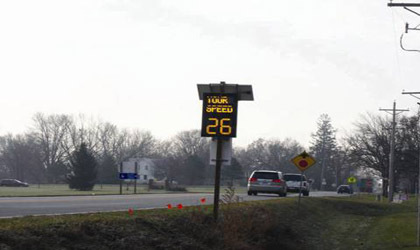 For vehicles approaching between 30 mi/h and 75 mi/h, the message "Slow Down 25" was displayed. No other traffic-calming treatments were in place at this location. Due to sign purchasing and installation problems, the speed feedback sign was not installed at the same time as the other traffic-calming treatments in the study. Once the sign was in place, it experienced numerous electrical failures, and the analysis was limited to only one "after" period. The speed feedback sign, when operational, was very effective. Speeds measured just downstream of the sign decreased from 37 mi/h to 30 mi/h 3 months after the sign was operational. It is not known if the 7 mi/h speed reduction can be sustained over time. Pavement marking legends indicating "SLOW" (as shown in figure 11) were used at two locations along the western section of SH 210 in Slater. The first pavement legend was placed just inside the western community entrance. At this location, there was a park and a crosswalk that children used to cross to and from school and the park. The second was placed about 1,500 ft downstream of the first location. Figure 11. "SLOW" pavement legend in Slater. The "SLOW" markings were not effective in reducing speeds. As shown in table 8, the 85th percentile speed actually increased for traffic entering Slater just downstream of the first pavement legend. There was little or no reduction in vehicle speed just downstream of the second "SLOW" marking. Data were not collected for the 12-month data collection interval because the road was resurfaced after the 9-month data collection period. Table 8. Speeds before and after installing "SLOW" pavement legend. Speed limit markings (figure 12) modeled after European entrance treatments using colored pavement were used at the east and west community entrances to Dexter. The treatment was also placed west of the community on a curve just before a steel fabrication plant, as requested by the community. Community members were concerned about the combination of large trucks backing out of the plant and high-speed vehicles approaching the plant after negotiating a horizontal curve. 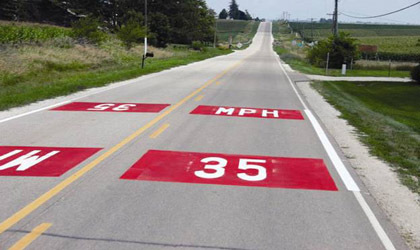 A large red rectangle (9.5 ft by 12 ft) was used to frame the on-pavement "35 MPH" speed limit markings. An 8-inch edgeline was also painted along the treatments to enhance visibility. Figure 12. Speed limit markings with experimental red background in Dexter. As shown in table 9, the treatment was very effective in reducing the speed of traffic entering the community. Speeds downstream of the curve on the western edge of Dexter and at the western entrance decreased from 4 mi/h to 9 mi/h during most analysis periods. The speed reductions at the eastern entrance to Dexter were not as dramatic. This may be due in part to the prevailing speed in the baseline period at the east entrance, which was already lower than the west entrance to the community. Table 9. Speeds before and after "35 MPH" pavement legend with red background markings. Table 10 summarizes speed impact, cost, and maintenance requirements for the various traffic-calming treatments evaluated in this study. The effectiveness of the treatments in reducing speeds varied widely. Table 10. Summary of impacts and costs of rural traffic calming treatments. The most effective treatments were the speed feedback signs, speed table, median island using tubular markers, and speed limit markings with red background. The converging chevrons and transverse pavement markings were somewhat effective with speed reductions generally less than 3 mi/h. Lane narrowing using pavement markings to create a center island, lane narrowing using shoulder markings in combination with on-pavement speed limit markings, and on-pavement "SLOW" markings were either not effective or were only marginally effective. Design vehicles should be considered when determining the type of traffic-calming treatment to implement. For example, farm vehicles and heavy truck traffic are common in many rural communities and must be accommodated. Maintenance can be an issue with many traffic-calming treatments. For example, the tubular channelizing markers used in this study to create a center island were effective in reducing speeds, but the tubular markers were frequently struck by vehicles and required frequent maintenance. The speed feedback signs provide a different example in that, to be effective, agencies must establish the capability to troubleshoot and maintain these signs within a reasonable response time. Cost effectiveness is always a factor in selecting traffic-calming treatments. While speed feedback signs were effective in all situations, their higher cost make them most appropriate for areas where it is critical that drivers slow down, such as near schools, playgrounds, or community pools. Durable pavement marking materials (such as thermoplastic, tape, epoxy, or other paint alternatives) should be considered when the markings extend within wheel paths. Standard paint products wear quickly and without frequent reapplication can reduce the effectiveness of the message. Community buy-in is important. In several cases, although community leadership was onboard, the community was opposed to the treatment, even when it was proven to be effective. Lane narrowing using just pavement markings to create a center island or shoulder was not effective. The lane narrowing treatment that used tubular markers to create a center island was more effective, suggesting that lane narrowing is most likely to be effective when drivers are presented with a physical object that causes deflection. Small communities may not be familiar with traffic calming and may need additional education. Small communities often do not have a traffic engineer and appear to be addressing perceived speeding problems by lowering the speed limit, believing wrongly that this will change driver behavior. While lower travel speeds may be desirable, reducing the speed limit is not likely to have much effect. Speed limits in the transition zone between the rural and built-up area in small communities were often improperly set, extending well passed the edge of the community into rural agricultural areas where there was no reason for reduced speeds. In other cases, the speed reductions were abrupt without appropriate speed reduction warning signs. The maximum speed reduction observed in this study was 9 mi/h. 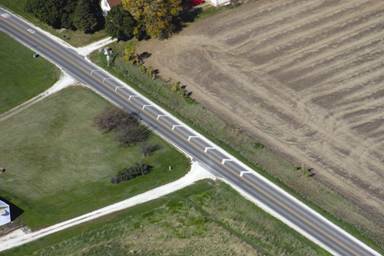 Physical measures such as roundabouts and curbed center islands may be needed to achieve the speed environment that rural communities often desire. Large areas of pavement markings, such as the speed limit markings with colored background, may become slippery when wet. Communities planning to use such treatments should ensure adequate skid resistance is provided. High friction surface material should be considered. Speed tables are only appropriate when the posted speed limit is 30 mi/h or less and approach speeds are less than 40 mi/h. Speed tables are not recommended for use on routes with significant (more than 5 percent) truck and bus traffic. Because emergency response times may increase, emergency service providers should be consulted before installing speed tables. STOP signs should not be used for traffic calming. The chevron markings, transverse markings, and red background for pavement legend evaluated in this study are not standard devices and require experimental approval in accordance with section 1A.10 of the MUTCD. Department for Transport. Traffic Calming on Major Roads, Traffic Advisory Leaflet 01/00, London, 2005. National Roads Authority. Guidelines for Traffic Calming for Towns and Villages on National Routes, Dublin, February 2005. Clarke, A. and Dornfield, M.J. Traffic Calming, Auto-Restricted Zones and Other Traffic Management Techniques, Publication No. FHWA-PD-93-029, Federal Highway Administration, Washington, DC, January 1994. Department for Transport. Village Traffic Calming—Accident Reductions, Traffic Advisory Leaflet 11/00, London, 2005. Manual on Uniform Traffic Control Devices for Streets and Highways (2003 Ed), Federal Highway Administration, November 2004. Researchers—This study was performed by Center for Transportation Research and Education at Iowa State University under Cooperative Agreement Number DTFH61-06-H-00003 with the Iowa Department of Transportation. Tom Welch was the Project Director. Shauna Hallmark and Neal Hawkins were the Principal Investigators. For more information about this research, contact Ray Krammes, FHWA Project Manager, HRDS, (202) 493-3312, ray.krammes@fhwa.dot.gov or Edward Sheldahl, HSSD, (202) 366-2193, edward.sheldahl@dot.gov. Availability—The TechBrief may be obtained from the FHWA Product Distribution Center by e-mail to report.center@fhwa.dot.gov, fax to (301) 577-1421, phone to (301) 577-0818, or online at https://www.fhwa.dot.gov/research/tfhrc/programs/safety/. The full report is available online at: http://www.ctre.iastate.edu/research/detail.cfm?projectID=-226410767. Quality Assurance Statement—The Federal Highway Administration (FHWA) provides high-quality information to serve the Government, industry, and public in a manner that promotes public under-standing. Standards and policies are used to ensure and maximize the quality, objectivity, utility, and integrity of its information. FHWA periodically reviews quality issues and adjusts its programs and processes to ensure continuous quality improvement.